Comfort Pads Now Available in 3 Densities! 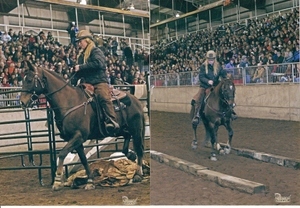 Give your horse more comfort and support in each step! The EasyCare Comfort Pads, both the 12 mm and the 6 mm are now available in three densities - soft (green), medium (black) and firm (red). 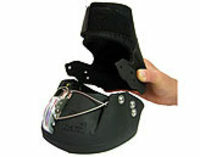 The pads come in sizes Small (fits boot sizes P-2) and Large (fits boot sizes 3-7). They are available in a style to fit the Old Mac boots as well. The 6 mm pad may be used by itself or stacked in any desired combination for your custom application and is great for modifying boot fit. 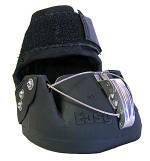 These pads increase heel comfort so that all horses-sound or unsound-are encouraged to move correctly. 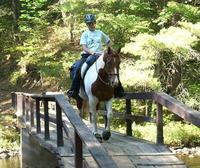 We have found that Comfort Pads are especially beneficial for any horse that is ridden. 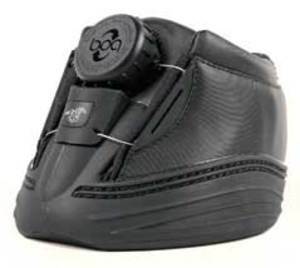 The pads can also be used to help improve the fit of the boots while at the same time providing cushioning, additional protection, and frog support to the hoof. Comfort Pads are an excellent way to help the horse owner successfully transition a horse from shod to barefoot. Sold in pairs. When ordering please specify: 1) Boot style, 2) Boot size, and 3) Pad Density. You can call 1-800-447-8836 to order or click here to order on our website. In celebration of Thanksgiving, EasyCare will be closed from November 27 -30, re-opening on Monday, December 1, 2008. As a reminder, our Bun Warmers are on sale through November 30, at 15% off ($55.25) with no quantity limit. Place your orders today or anytime on our website. Have a wonderful joyous holiday from all of us at EasyCare! Here he is, the most beautiful Friesian/Lippizan ever seen at EasyCare. Grasshopper and I live in Anchorage, Alaska. I have spent my entire life living on the same 2 acres of land in this ever growing community. We are blessed. We have the best of both worlds, the beauty of this state is just outside our back door and yet the city is only minutes out our front door. Grasshopper is my love, he is half Friesian, half Lipizzan. He is the best of both worlds, smart, athletic and a ton of personality. Because his feet are so strong, I keep him barefoot all year round. Living in Alaska means embracing the outdoors, and that meant finding an alternative to ice shoes. The standard borium studs terrified me. Grasshopper is not a small boy, he is a power house and with one wrong move he could slice a leg, so we decided to try Boa Boots. The studs are great on ice, they dig in and allow us to cross roads, creeks and trails that we other wise would never be able to venture across. The gaiters do a magnificent job of protecting the bulbs of his heels and keeping a majority of the snow out. Without the gaiters I would not be able to ride in the snow. We found the snow packed in and caused his heels to bleed. I only did that once! The replacement parts have been a wallet saver. The laces are easy to replace. Should a stud come loose and fall out, we can easily replace them. After years of HARD use my Boa boots are still holding up. 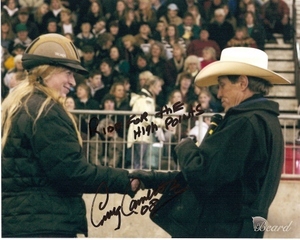 Thank You Frieda and Grasshopper, many safe and Happy Trails to you from EasyCare. EasyCare is having a 15% off sale on our EasyBun Warmers! This sale is valid thru the month of November and is for website orders only. There is no limit, so you can purchase as many as you like. Just use the promo code EASYBUN at checkout, and you will automatically receive the discount on your order. Our Easy Bun Warmer is made of a waterproof and breathable rip-stop nylon shell, with a fleece lining that extends from edge to edge. The weighted corners allow for the best stay-put rump rug in the endurance world. The elastic drawstring cinch cord on each side also allows for easy roll-up and storage while riding. It measures 31" from the back of the saddle to the tail, and 50 1/2" from side to side. 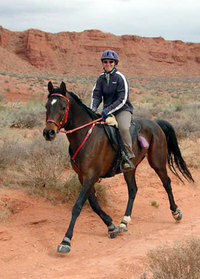 Sizing is universal for English, Western and Endurance saddles. Black only. With the weather cooling, the price is right for this needed item. These will also make wonderful holiday gifts for your riding buddy. They will remember this thoughtful gift all season long, everytime it gets used. If you have ever wondered about the functionality of boots on large draft type horses, just watch this video on the use of Boa boots on a Shire mare. The boots are actually helping her with comfort because of an incident that occurred from steel shoe use. To see how awesome Brenda moves with the boots on, is very exciting! She wears a size 7 Boa boot, and that is a really large boot. The largest size that we make at this time is size 8 in the Boa boot style. These success stories are what keeps EasyCare striving to come up with styles and sizes to accommodate the large variety of equine sizing out there. Thank you Brian Reid and Brenda for sharing your success! The testimonials for Epics are endless. Melanie sent in a picture of her and Bo with only good things to say about our boots. Bold Again (Bo) is 13 and a 1/2 Arab 1/2 Standard bred. I got him last winter from a local horse rescue group (www.wasatchhumane.org). He had been turned in as a bucker by his former owner who had tried to do dressage with him. After doing lots of ground work with him I started trail riding him last summer. I could tell that he was a lot happier out on the trail than he was in the arena. He still gets tense when we do arena work. Color Country was his first endurance ride. We did the LD and he did really well. He can get racy when he's out front so we rode with Janet Tipton and her mustang Ladybug and took it slow. This was also his first ride of any kind with all four boots (we'd previously ridden in fronts only) and that went really well too. The Epic with the new improved gaiter and stronger cables has proven to be one of the favorite among boot users, with many miles of comfortable riding to write home about! 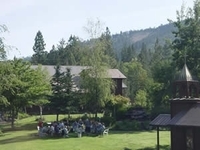 EasyCare is excited to announce that Dr. Robert Bowker, VMD, PHD will be conducting a clinic on August 2-3, 2008 at the Oregon School of Natural Hoofcare and it is open to the public! 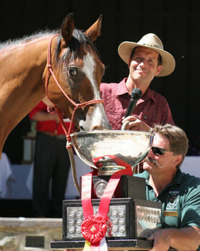 Dr. Bowker is a professor of anatomy and director of the Equine Foot Laboratory at Michigan State University's college of Veterinary Medicine. 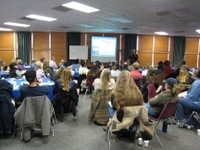 Dr. Bowker helps everyone understand how the equine foot functions, repairs and works. This is a fantastic opportunity to listen, and interact with Dr. Bowker, as well as other hoof care professionals. For more details please contact Cheryl Henderson at 541-899-1535 and/or visit the school's informative website. Don't miss this amazing opportunity! This is a photo of a sixty plus riding grandmother Pam Mixon. Riding Lily, her five year old, champagne singlefooting mare. " We trail ride and NEED our Easyboots." Lily has such small feet that she needs a size 0. We were riding in the Bankhead Forest, and lost both front shoes, which was a first for Lily. We didn't have a boot to fit, but after walking in with her, I called EasyCare and took care of that problem ASAP. Now we don't venture out without our Easyboots...I'm too old to walk that far! Get a Free Hoof Pick with Old Mac Horse Boots! If you want a really great FREE hoof pick, buy a pair of Old Mac Original boots or the Old Mac G-2's and you will receive a FREE magnetic hoof pick. Never lose your pick again....just put it on the metal fence rail and it will stay put! No more digging in the bottom of your bucket, or gear bag for your hoof pick. Just place it on the inside of your tack door, the wall of your tack room, or even on the dash board of your pickup! This is a $7.95 value and there is no limit on boot quantity. Buy one pair and get one FREE hoof pick. Just enter your HOOFPICK item and the promo code OLDMAC in the code section at checkout and the $7.95 will be discounted from your order. This web special will be valid July 1st - 31st, 2008. We here at EasyCare wish you, your family and your equines a safe and joyous July 4th Holiday! The many success stories we receive at EasyCare are always a pleasure to post. They also give a strong feeling about how much hoof protection is valued among the barefoot community. This is a story about "Peanut", who has been riding in Epic boots for nearly a year now. In the beginning, there were concerns with the cables fraying but have now been replaced by a stronger more durable material as well as the new improved gaiter . 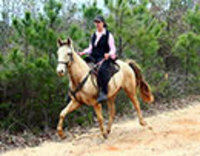 They ride in extreme rough terrain, and the fact that the boots stay on in sucking mud conditions is what amazes Peanut and his owner Lori Lyons. They heard about the Epics from their friends who also enjoy riding in these fine boots. Thank You Peanut and Lori from your friends at EasyCare! Check out Martha Nicholas riding her horse, Curly, in the Extreme Cowboy Race wearing EasyCare Bare boots, that she modified by installing the cable/buckle system. These races are featured on RFD TV. Everyone was sure inquisitive about those boots on the horse, so Martha shared her knowledge with all. She is going on to another race this month in Washington called the Extreme Trail Challenge. Martha is also one of our Team Easyboot members! 1) Use BodyGlide all around the fetlocks. 2) Loosen gaiters if you feel they are too tight (Usually they are tightened as much as possible per the Epic instructions). 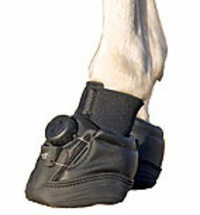 3) Use vet wrap and/or knee high nylon stockings by starting at the hoof and going up to the fetlock joint. 4) Wrapping duct tape around the pastern has also helped with rubbing issues. These are a few suggestions from EasyCare that we have either heard from our users or experienced ourselves. Click here for more helpful tips from Karen.